This was a big, half-day workshop and so a bit longer than my typical presentation. I do use color occasionally to call out important topics, "chapter headings" etc. It's not critical to the process but it can help when you want to keep track of a lot of information. This looks very much like the piles of cards that were generated during a personal coaching session I facilitated yesterday. The client was feeling overwhelmed with his life-long to do list. I invited him to generate a list by recording his tasks, goals, dreams on cards, one for each. He's now processing and reordering, color coding, clustering. I'm afraid he's feeling more overwhelmed than ever, but complexity as well as patterns are emerging from the process. Thanks very much for posting this. You hit me at just the right time with this post. I'd been taught to organize thoughts and essays using this method in high school and college, but it never entirely worked for me. I think I got too caught up with the format and the methodology and couldn't clearly see through those structures to the actual content. Now I've written several chapters worth of material on Isamu Noguchi and wrote myself a note to do today: "Noguchi Chapter: break into coherent section." I've tried using mind mapping and other approaches, but I think the simple, tangible file card will be exactly the right prescription for my malady. There is an approach to writing fiction that is a bit similar to this. 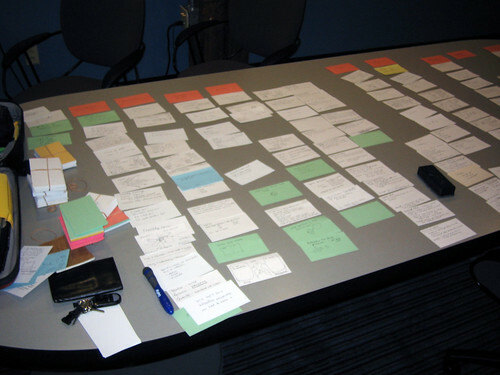 You start by capturing themes and scenes and other elements on index cards and then start clustering them and arranging them into a framework of a story. For some reason I think Robert McKee teaches the approach but I am probably mistaken. I find the electronic version of this concept to be easier to manage. OmniOutliner is great for something like this. Wow. I had never thought of organizing a talk this way in real-time. That's definitely worth a try. My gut says it will work better for longer talks where there is a lot of interaction with the audience. Very interested in hearing more about that chapter. Noguchi seems like a very interesting person but I haven't seen a lot on him in English. I can see how that would work well. Vladimir Nabokov was known for writing his novels using index cards. I know many who would agree with you. Maybe it's a matter of personal preference or learning styles. One reason I like cards is that I can quickly and easily bring the cards into a conversation at, say, a coffee shop, to discuss the ideas. Yes, dave, I find your approach very useful. It's also very interesting the concept of conversation you've just explained. I find myself Mind Mapping useful also and think it can be combined with your method. Used this method for years and then moved to post-it notes. Now I use mindmapping. It's saves money and trees. I take a more visual approach - I find it useful, as a presentation starts to take shape, to print it out 6-9 slide per page and staple to a board. then use post it notes pr just write on it things that still need to happen/change. It's a good way of switching between creator/editor modes. It's like working on a storyboard. But your approach sounds interesting for the first stage of creation and I intend to try it soon. I always start with the question "what do I want out of this?" It's all about me. Who is my audience? What do I want them to know, believe, do, and feel? How do I want to be seen? How do I build my credibility? These are the first questions I ask. Then I analyze the audience and perform the necessary prolapsys, develop thesis, form outline, yadayadayada. I like the notecard system as well. However, when on the go and working, they are not always convenient. MindJet MindManager is FANTASTIC as a digital substitute. Great stuff Dave. I'm glad I checked back after..........3 years. I have experienced several times the effect you can produce in an audience, Dave and I can tell you that, while the method helps a lot to organize your thoughts, at the end is the way you engage them into conversation that does the trick. Thank you so much for writing this blog. I'm the teacher who wrote asking for your advice for my students (and me :)). Your blog was such a help to students as they learn how to create structure--and you now have a growing fan base in Michigan! Thanks again for giving us a window into how an expert thinks! My pleasure Janice, thanks for the note! Other thoughts to support your process are tools, like 3x5 rings or notebooks, carson dellosa teacher supplies has pocket wall charts to add another dimension of organization. Also, try using a deck of playing cards with postits or labels and trying to put your thoughts in a different 'structure'. I use yellow stickies on the wall for the same type of process. I find it also helps me when I need to write longer items, like ebooks. Organize the thoughts, have them transcribed, then edit. Its really a good approach, to find out what is important.. But i do feel, the final conclusion, differs from person to person. whats your opinion about this? I like to do this with note taking or 'sketchnoting' which is more what I do. It's hard to show relationships between things in a linear list or book. Cards let you capture ideas/concepts (group them) and place them in relation to other cards/groups. Isn't this how your brain works anyway?